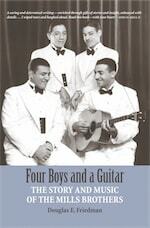 FOUR BOYS AND A GUITAR: The Story and Music of the Mills Brothers is the only biography of this famous American singing group. FOUR BOYS AND A GUITAR: The Story and Music of the Mills Brothers is the only biography of this famous American singing group. 70 Chart hits over a 37-year period! The book tells the group's story from their humble beginnings in Piqua, Ohio to their rise to international stardom. The racial aspects of their story are also covered, especially as they mirrored the racial history of the country over the course of the group's career. Biography of 1930s German-Jewish vocal group forcibly disbanded by Nazis. A comprehensive history of pre-1950 American vocal groups. Douglas E. Friedman is a retired attorney and the co-author of Who Sang Our Songs?, a songography of 1950s rhythm-and-blues and doo-wop vocal group music.